GATECRASHER alert? 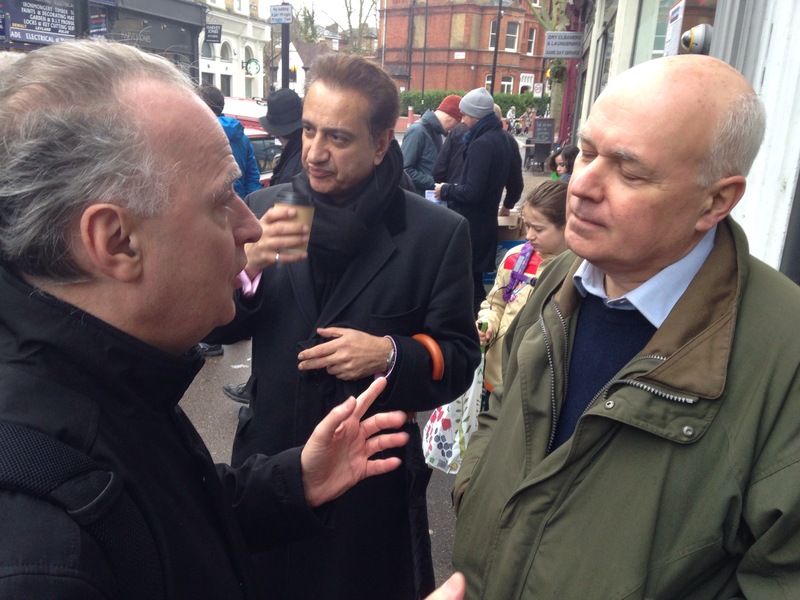 Nigel Rumble, both a George Clooney lookalike and former Conservative council election candidate, was determined to tell IDS how much he admired him as he helped out on a street stall in England’s Lane yesterday. Now an ‘independent’, he told the former Duncan Smith that he was still friends with many local Tories and was considering returning to the party. Big news, as we all know the value of an endorsement from the Belsize activist; see proud badge on top left of the homepage to this site. And yet as IDS, unaware of the parish history, celebrated the idea of someone coming back to the party, some of the local councillors did not seem to share the same enthusiasm for a Rumble reunification. Mr Rumble jumps in to congratulate IDS for being such a principled politician, telling him that he is an independent but is considering rejoining the Conservatives. Local chairman Gio Spinella, with a deafening heckle, reminds him that he has also had spells with the Lib Dems and Labour, suggesting that if he came back he’d only be back for five minutes and asking if he’d ever join UKIP or the Greens to complete the set.